Ananka's Diary: It's That Time of the Year Again! Each December, blogs all over the world seem to hone in on the very same subject. Krampus. This year, I've decided to join the fun. So what's Krampus, you ask? Krampus is a hideous demon-like creature that originated in the deep, dark, desolate forests of Northern Europe. He's said to accompany St. Nicholas on the jolly man's gift-giving journeys (shown above). But while St. Nick hands out presents to good little children, Krampus gives bad kids a good kick in the pants (or much, much worse). 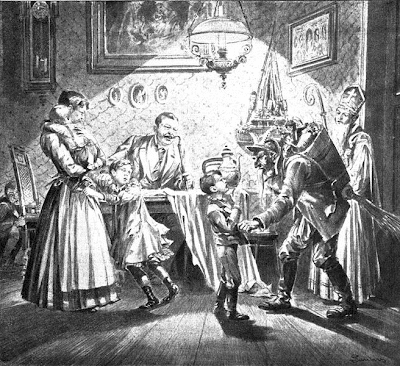 Traditionally, young men dress up as the Krampus in the first two weeks of December, particularly in the evening of December 5, and roam the streets frightening children and women with rusty chains and bells. In some rural areas the tradition also includes birching by Krampus, especially of young females. Cool! I am the first to post! I've never heard of Krampus before. I know soooooooo many people who deserve a visit from Krampus. Wow I never knew of this before. It's certainly a new and interesting tidbit about the holiday to share with my family. Portraying Saints as working with demon companions has always seemed a bit messed up to me. And if some guy in a demon costume tried to birch me, I would call the police. wow wouldn't want to see THAT in a dark alley! In Slovakia, Kris Kringle is called St. Mikulas (Mee koo lash), which sounds sort of like Nicholas. His day is also Dec. 5th. Kids put out their shoes at night and in the morning they get candy and fruit in them. It's also called Angels and Devils day. At the entrance of our school, students dress up as the angels and devils. Then they try to get this black makeup on everybody's faces as they come. We try to avoid it. Your picture looked very much like St. Mikulas. 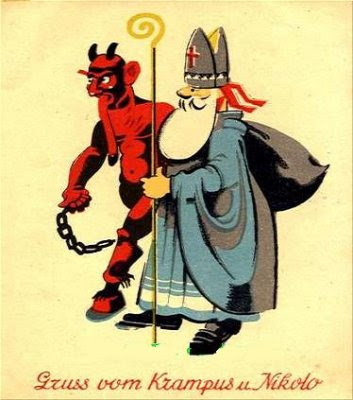 "Gruss vom Krampus u Nikolo" from the postcard means "Greetings from Krampo a [as in the abbreviation of and] Nikolo [as in, I suppose, Saint Nicholas]." Creepy! Nellie: You and your sister never cease to astonish me. wish me luck on my presidential campaign coming up! Sounds kind of gruesome if you ask me. Saint Nicholas should step in!! That is really interesting, Nellie. some girl in my class told me Santa was invented by Coca cola. Well at least "the big red jolly guy". I don't know how much of that is true, though. I wonder that if i don't like someone much, perhaps I could leave them with a "Krampus will sort you out." Muwahahaha. Kay... that is KREEPY! I've never heatd of a Krampus before. I don't really like the whole idea of it. First off, it's name. It just sounds weird, Kramp-us. And the idea of a Damon thingamabob coming in with Santa is just plain wrong. ~ I can just imagine it. Santa- Wait! Thats the parents roo- (Hear the screaming of mother, and gunfire from dad. Then all the kids start crying) - Oh, dear. Not again. The costume looks like something from Narnia gone wrong. Creepy stuff! I love it! Gnat: Me too. You get coal in your stocking and it's BBQ cookout time! The Pennsylvania Dutch have their own version--Beschnickel. He throws candy on the ground. The kids bend over to pick it up. And he whips them. Even the Krampus is a sexist! I think I like the Krampus. Do you think Santa would let me hire him? I know a few people who should get kicked by a demon on Christmas. Anna- Those books are really interesting! I've got one called Weird Missouri. Kiwi: Haha! Hilarious! You should try writing scripts or something, that is spectacular!